Hugo Southwell admits missing out on a century at the weekend was frustrating but, for the Carlton man, the most important thing was that his team took a step closer to the CSL Eastern Premiership title by beating Arbroath. The Grange Loan side now have one hand on the trophy after Saturday’s 64-run home victory. This coming weekend, they head to Aberdeen and, if results go their way, Steve Gilmour’s outfit could be champions by Saturday night. Batting first, they did not start that well against mid-table Arbroath, Arun Pillai, Kyle Macpherson and Gilmour back in the pavilion by the time the score had reached 48. It was up to the experienced duo of Fraser Watts and former rugby union internationalist Southwell to rebuild – and they did that in some style. They put together a 200-run partnership for the fourth wicket and, as a result, both were close to centuries as the score went up past 240. However, eyeing up three figures, Southwell was caught by Craig Ramsay off the bowling of Calvin Burnett for 98 and then, soon after, Watts fell for 96. In the end, the home side posted 259-7 from their 50 overs and they backed their bowlers to go about defending that total. 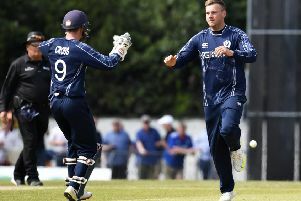 With Scotland man Ali Evans reinstated to get some overs under his belt, Arbroath found it hard to get him and opening bowling partner Mario Olivier away. However, they progressed nicely to 111-3 before spinner Chayank Gosain got the key wicket of the dangerous Burnett for eight. From that point onwards, Carlton had the upper hand as they pushed for another win to keep them top. Elton Willemse batted well with 81 for Arbroath, but he ran out of partners and, in the end ,the Lochlands outfit were 195 all out. Gosain took 3-65 to hoist him up to 21 league wickets this summer while former Scotland captain Gordon Drummond’s good recent form continue with 3-40. South African Olivier also picked up two wickets and Southwell said: “This was a really pleasing win because we know how tough a side Arbroath can be to beat. “They had already beaten us in both the league and the cup this summer and, on a tricky wicket this time around, we struggled a bit early on. “Arbroath were bowling pretty well and myself and Fraser knew that we had to stick around and build a platform. “For us to put on a 200-run partnership was pretty special and we knew that 259 was a good total on that wicket. To get out on 98 was frustrating, but I was just keen to help the team win. Watsonians are Carlton’s closest challengers still after they defeated Mazars Grange at Myreside. Andy McKay took 4-33 and Henk Conradie picked up three wickets to restrict the visitors to 159-9. Nick Farrar top scored with 33 for Grange. Captain Ewan Chalmers then made 66 for Sonians to help lead them to a three-wicket win after a number of early wickets threatened to derail them. Adrian Neill now has 36 league wickets for the summer after his 4-14 helped Heriot’s win at Glenrothes. Keith Morton’s men were victorious by nine wickets in Fife. The Baillie Gifford ESCA Championship title race is really on after leaders SMRH lost again. They went down to Kelso while RH Corstorphine are right on their tails after a seven-wicket victory over Mazars Grange II.